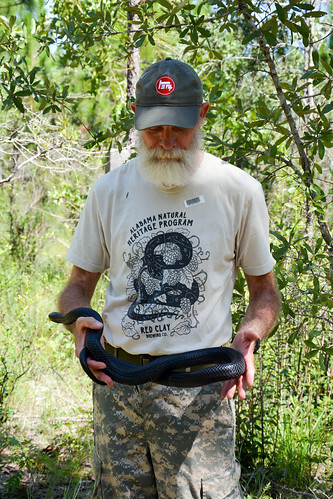 As part of an ongoing species reintroduction effort, scientists at Auburn University, along with numerous state and national partners, released 26 threatened Eastern indigo snakes into Conecuh National Forest on Friday, July 14. 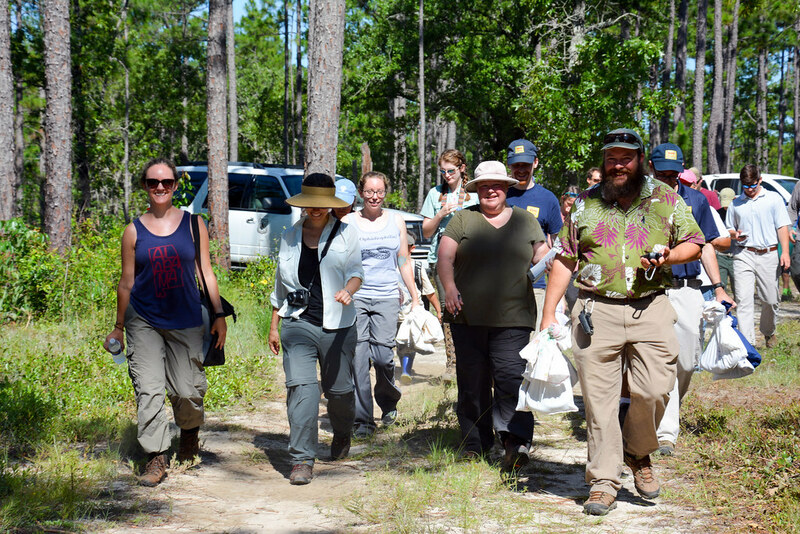 The release is part of an on-going project, coordinated by the Auburn University Museum of Natural History’s Alabama Natural Heritage Program, to reestablish the Eastern indigo snake in its native, longleaf pine forest habitat in south Alabama. The Eastern indigo snake is the longest native snake in North America, and may reach a size of 8.5 feet and a weight of 11 pounds for males, and 6.5 feet and 6.5 pounds for females. A non-venomous, docile snake, the Eastern indigo gets its name from its lustrous, glossy, iridescent blue-black coloring of the head and body. Prior to the reintroduction effort that began in 2010, there had been no confirmed sightings of the Eastern indigo in the wild in Alabama since the mid-1950s. Listed as “threatened” under the Endangered Species Act, the Eastern indigo is a non-game protected species in Alabama. Auburn University’s James Godwin holds an Eastern indigo snake, which is the longest native snake in North America, reaching as much as 8.5 feet long and 11 pounds. The snake disappeared from the state due to a variety of factors, including loss and degradation of their natural habitat, over collection associated with the pet trade, excessive mortality from automobiles, and gassing of their winter refuges to catch rattlesnakes. Eastern indigos like to eat other snakes, especially copperheads, a venomous snake that is responsible for more snake bites in the Southeastern U.S. than any other snake. As the Eastern indigo has disappeared from the south Alabama landscape, sightings of copperheads have skyrocketed, and researchers are currently monitoring how populations of copperheads change as Eastern indigos are reintroduced. "The morning after the first release in 2010, the first snake that was located was found eating a copperhead," said James Godwin, zoologist with the Auburn University Museum of Natural History’s Alabama Natural Heritage Program, who has coordinated the project from the start. Since the reintroduction effort began, approximately 130 Eastern indigos have been released into Conecuh National Forest. All of the snakes have been implanted with a Passive Integrated Transponder, or PIT tag, for permanent identification. 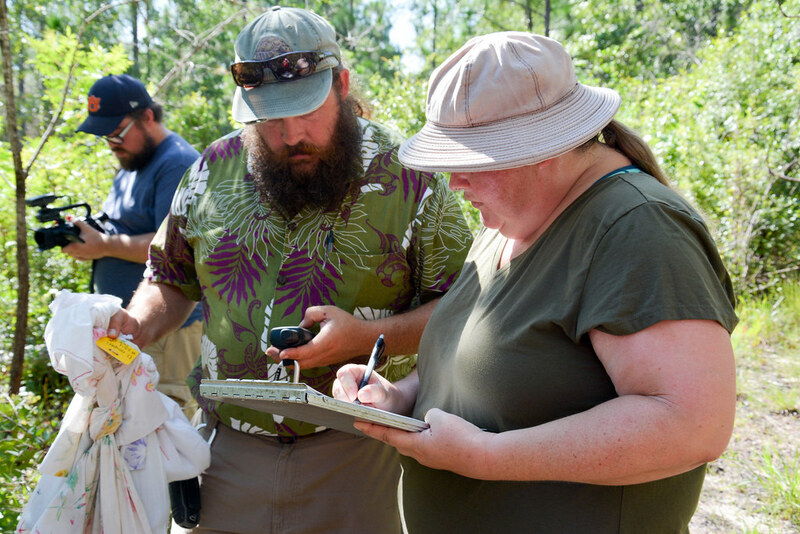 Early monitoring efforts were conducted by Jimmy and Sierra Stiles as part of their master’s thesis projects in biological sciences at Auburn University. The first release in 2010 involved 17 snakes that, in addition to PIT tags, were implanted with radio transmitters for tracking purposes. Each Eastern indigo snake release was implanted with a Passive Integrated Transponder, or PIT tag, number for permanent identification. In this photo, Jimmy and Sierra Stiles log the precise release location and PIT tag number of an Eastern indigo. In Alabama, the Eastern indigo is closely associated with the gopher tortoise because the snakes use gopher tortoise burrows for shelter. As such, many of the release sites in Conecuh National Forest have been located near gopher tortoise burrows. The Eastern indigo snakes that have been released in Alabama were raised in captivity by agencies such as Zoo Atlanta and Central Florida Zoo’s Orianne Center for Indigo Conservation. Rearing and breeding large snakes like Eastern indigos can be costly, and challenges include maintaining enough adult snakes for breeding, pinpointing the most effective methods for breeding, warding off disease, and successfully incubating the eggs. Thus far, a combination of resources and expertise have allowed for success in captive rearing and breeding of Eastern indigos, and the effort continues to grow. Children were included in the 2017 Eastern indigo snake release as a means of instilling an appreciation for the natural world in a future generation of leaders. The longleaf pine ecosystem is endangered. Once the most extensive forest system in North America representing 90 million acres, the longleaf pine forest has been reduced to an estimated 2.7 million acres. As the longleaf pine forest has dwindled, many plant and animal species associated with it have also declined, including the Eastern indigo. 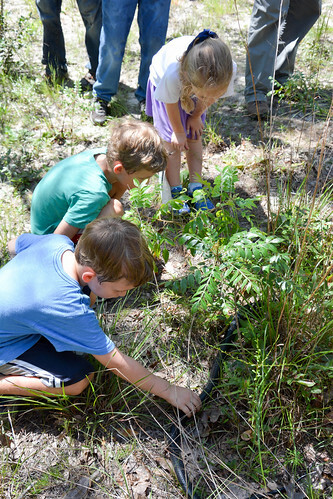 Reintroduction of the Eastern indigo is part of a larger conservation effort to reestablish the longleaf pine forest in the southernmost part of the state of Alabama. “It’s not just about the snakes and the trees. It’s about people as well,” said Mersmann. “Functioning ecosystems that were so common in the south are part of our natural heritage, and the work that we do and the reintroduction of the indigo is really part of leaving a legacy for the future." Dozens of agencies and people of all ages were on hand for the 2017 release, including families with young children. The Eastern indigo reintroduction project is made possible by a Wildlife grant from the Alabama Department of Conservation and Natural Resources. Other partners in the effort include: Auburn University Museum of Natural History’s Alabama Natural Heritage Program; Central Florida Zoo’s Orianne Center for Indigo Conservation; Zoo Atlanta; U.S. Fish and Wildlife Service; and the U.S. Forest Service. For more information on the Auburn University Museum of Natural History’s Alabama Natural Heritage program, go to www.alnhp.org. Dozens of people from various agencies were on hand to assist with the release of 26 Eastern indigo snakes in Conecuh National Forest.